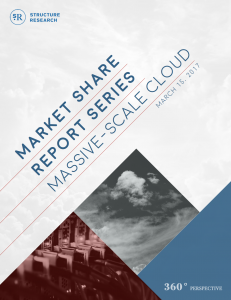 This report measures and projects the massive-scale cloud infrastructure market. We have provided individual company projections and a five-year CAGR for the market. 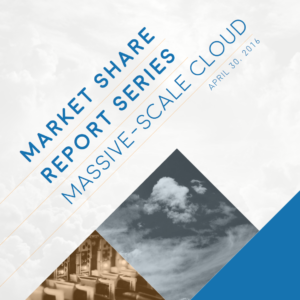 Last year, we published our first massive-scale cloud market share report. The report focused in on seven providers with meaningful levels of scale and overall growth was healthy, albeit very top-heavy. A year later, the market has undergone some meaningful changes and as a result, the growth trajectory has moved slightly off our previous projections. In this update, we account for that and adjust our market estimates accordingly. In 2016, the massive-scale cloud (MSC) infrastructure market approached $18b in annual revenue and our projected CAGR for 2016-2021 is now at 45.8%. This is down from our previous five-year CAGR and reflects, in large part, the slowing we have seen at AWS. But there have been other moving parts that have had an impact. Rackspace, for example, is shifting focus and its public cloud will likely slow, while Google, Azure and Alibaba, all have shown signs that they will continue to trend upwards. Why else has the market shifted? Not only has the competition upped its game, there has been growing reluctance to make all-in bets on a single platform and an increased awareness of the need to build backup plans. This has pushed more organizations to consider their options and look at alternatives to AWS. This report provides growth rate projections and total revenue estimates for the massive-scale cloud providers on a five-year basis. 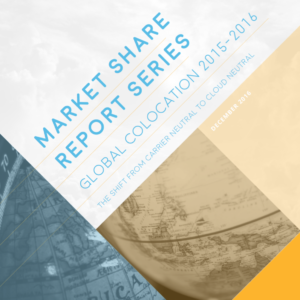 Included are geographic splits and a total market share summation. The big picture take: this is a healthy and growing market, but there are signs that the competitive dynamics are shifting and emerging market maturity, coupled with measured adoption, will moderate gains in the next five years, while adjusting the market share distribution.